McKinsey project that autonomous vehicles including drones will deliver 80% of all items in the future. With 35% of consumers indicating that they are in favour of the concept, it’s clear that the use of cargo drones is gaining popularity. 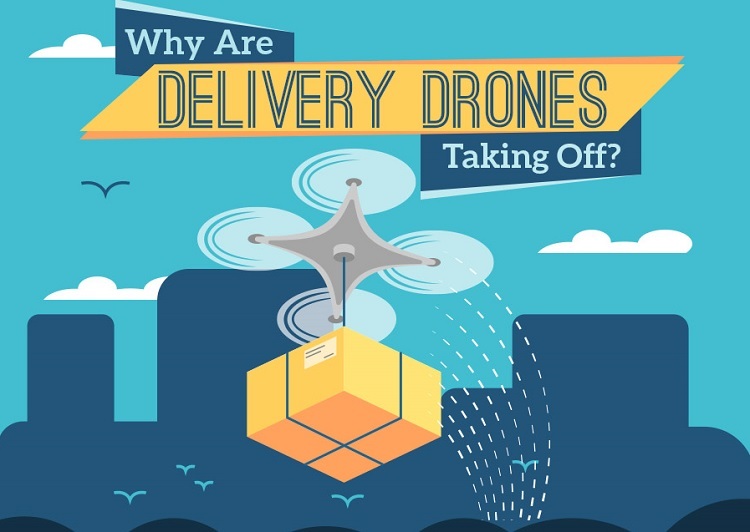 In this post the Infographic examines the benefits and challenges associated with delivery drones and highlights how this technology could massively disrupt last-mile delivery. In the US alone, drone delivery has surged from a $40 million industry in 2012 to $1 billion in 2018. It’s clear that more and more businesses are beginning to realise the enormous potential of drone delivery to transform logistics as we know it. Experts have identified last-mile delivery as one area in particular that could benefit from drone delivery. The most difficult and expensive leg of a package’s journey, last mile delivery is estimated to make up a whopping 50% of the total cost of distribution. Advocates of cargo drones believe that their use could help cut down the cost of last mile delivery, particularly in urban areas. They propose that this could be achieved by transporting packages from a local distribution centres to a specific address. The package delivery and supply chain management company, UPS, has done much work to investigate the use of drones to optimise last-mile delivery. They propose installing mini-helipads on the top of their vans for drones. The aim of this is to eliminate the final mile from the route – thereby saving up to $50 million in costs for their 66,000 daily delivery drivers. Drones: A More Eco Logistics Solution? Not only will the use of drones help to cut costs and improve delivery times, but some suggest that they could also lower the environmental impact of delivery. On average in the US, truck delivery of a package results in about 1 kg of greenhouse gas emissions. By reducing the need for trucking, cargo drones could slash fuel usage and potentially carbon emissions. Why Aren’t Drones Mainstream Yet? There are still many challenges that need to be overcome before drone delivery goes mainstream. Perhaps the biggest issue is a legal one – as the majority of countries have laws in place restricting the flight of commercial drones in certain areas. There are also some technical issues that remain to be solved around limited battery life as currently, a single drone carrying one package can only fly just a little over two miles. Read the Infographic guide from 2Flow below to find out more about why drones are taking off.